There were 7/21 decisive games in RR7. The bottom of the table is almost decided, Jonny is 2 points below Ginkgo and has very little hope of closing the gap in the remaining games. The top of the table is still competitive, Stockfish and Komodo extended their lead a little in RR7 but Houdini is still within 1 point of the 2nd place. Houdini will win a tiebreaker against Komodo since it won a direct match, so it needs a good last round to have a chance to qualify to the superfinal. In the middle Fire and Andscacs have their private battle for 4th place. Stockfish - Jonny: Stockfish gave a rook for a bishop, then developed a strong king side attack. The black king was exposed and surrounded by white pieces, the game was adjudicated quickly. Stockfish leading again, with a score of +10. Houdini - Andscacs: Houdini had an eval advantage from the start, it got a pawn to the 7th rank but Andscacs stopped ot there. Houdini was a pawn up but only got an opposite color bishop ending and a draw. A missed chance for Houdini, it needs wins to get to the superfinal. Komodo - Jonny: Jonny gave a knight for 3 pawns early in the game. Evals remained low until move 25, then Komodo outplayed Jonny in a RNN vs RB position. Despite being 4 pawns down a single passer on the 7th rank was too strong. Komodo on +10 joint leader, 1 point ahead of Houdini. Stockfish - Ginkgo: Stockfish had an eval advantage from the start, evals remained low for the first 40 moves. 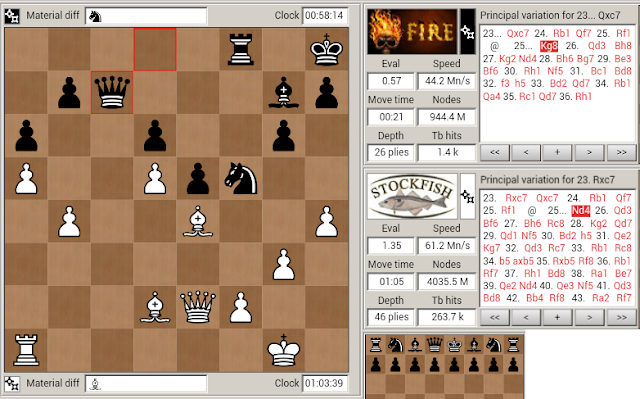 After pawns locked the queen side Stockfish opened the king side and evals jumped over 1 and higher. Ginkgo gave a bishop for two pawns to stop the attack, the game reached a RRN vs RR position. Stockfish started to capture pawns and the extra piece was enough for a win. Stockfish in the lead with +11. Komodo - Andscacs: Komodo created a pawn majority on the queen side and evals started to increase. Komodo's eval was over 4 when it created a queen side passer, it then gave a bishop to push the pawn to the 7th rank. This was more than enough compensation for the piece, the QB vs QBB position was winning for Komodo. Komodo is again tied with Stockfish in the lead. Jonny - Houdini: Houdini took over the initiative on move 23 when it opened the king side and started to push pawns forward. The white king was exposed and under attack, Jonny gave a rook for a knight and exchanged pieces. The game reached a BB vs RB position, winning for Houdini. Houdini still only 1 point behind the leaders. Stockfish had an eval advantage from the start, its eval increased over 1 very quickly. Material was balanced, Stockfish had a bishop pair and more space. Fire had control of the c file, while Stockfish prepared an attack on the king side. 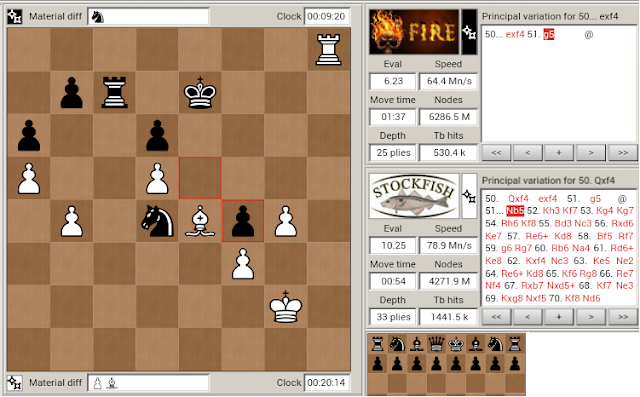 Stockfish pushed pawns on the king side and opened the h file. Fire had only one pawn on the king side left, and Stockfish's queen and bishop targeted it. The white rook could join the attack and the LS bishop made it hard for Fire's pieces to move. 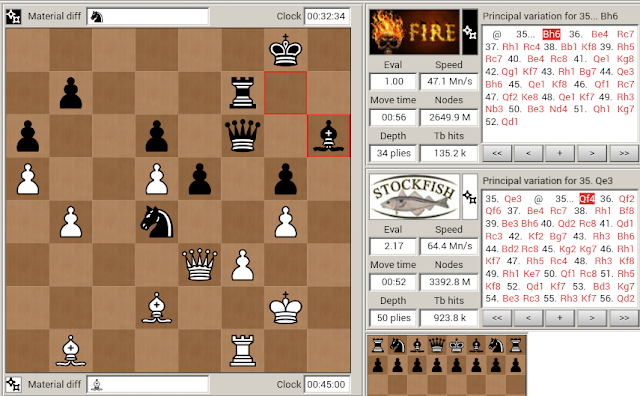 Fire lost the g pawn, it exchanged pieces to get to a RB vs RN position with Stockfish a pawn up and a king side passer. Stockfish pushed the passer to g6 where is was protected by the bishop, Fire had to use the king to block it. Stockfish had too many targets and Fire couldn't defend them all. With this win Stockfish is again sole leader with a score of +12.